I colored with Copic markers. The die I used is Gina Marie. 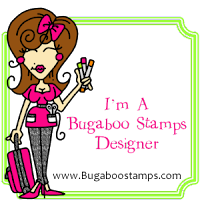 The sentiment is Stampin Up. Have a fab weekend! Thanks for stopping by! I have to admit, I went to the Etsy store and colored the image similarly to the one on the site.... I love the colors! 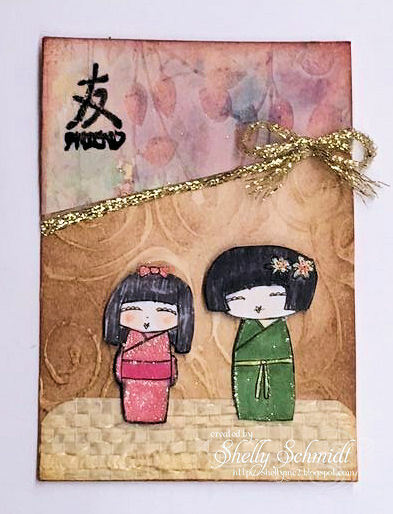 The image is by Sasayaki Glitter- a free digi given by Kit and Clowder this past week : ) The sentiment is SU. I used very few markers to color the image- all C's and low R's. The ribbon was pink, but I colored over it in R02 and viola- a match. The Guava color is SU, the gray is Coordinations. 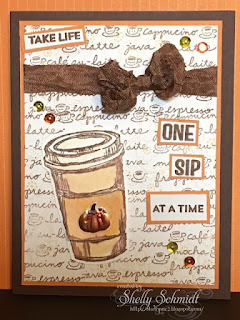 I made another card for the Coffee Lovers Fall Blog Hop- so fun : ) I am digging out older stamps that have not seen love for a while! Image is an older SU set inked in SU Ruby Red. 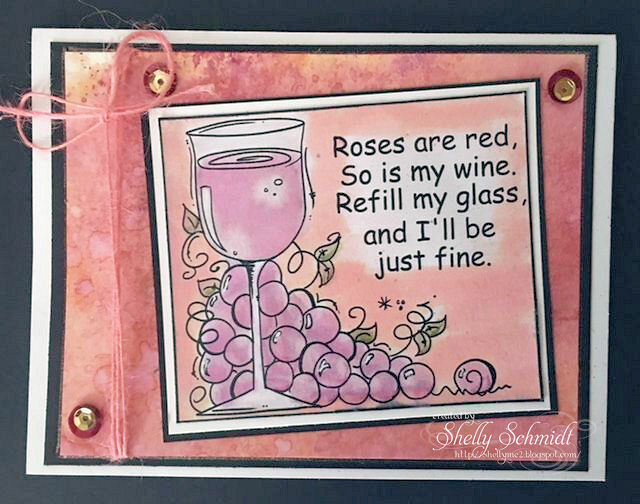 The sentiment is the center of an Embossing Arts image from I Brake for Stamps. I took the lid of a jar on my desk and inked up Close to Cocoa and stamped the corcles. 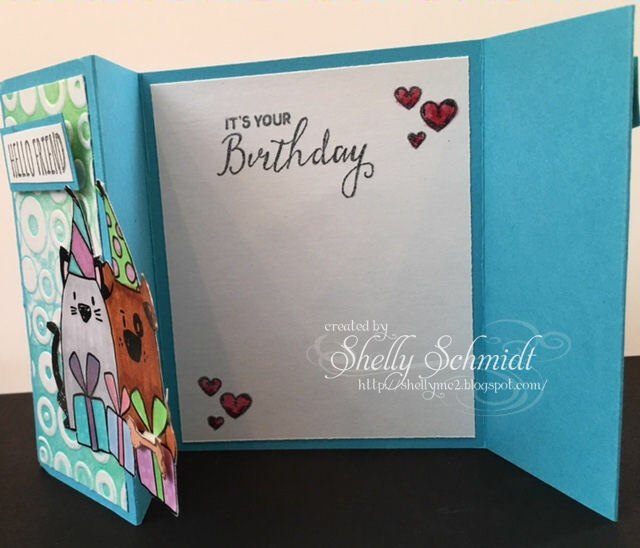 I used a Sketch (Paper Play Sketch 51)that is now closed, but it worked for the card. 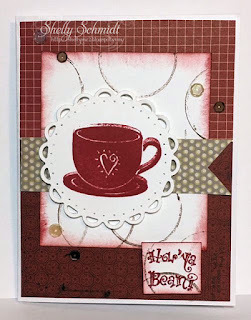 The cup is by SU and the sentiment Embossing Arts from I Brake for Stamps. Our Dueling Darlings post for this month- due on the 15th of each month has the theme of Chocolate. Terry A is the hostess for the Dazzlers (which is the team I am on), and Terry S is the hostess for the Diva's. 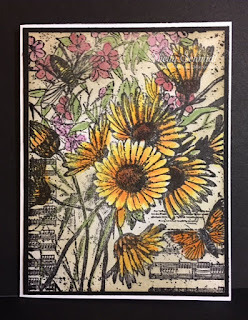 The image by Technique Junkies HERE is so easy to color in, and I am doing the daily coloring challenge for 30 days,- so very happy to get this image out and ink it up!!! The coloring is done with Copics, and I added just a smidge of shimmer using a Spectrum Noir Crystal Clear shimmer pen. Are you on Instagram? If yes, please leave me your link. I will look for you there- it is so much easier for me to use as I am out and running each day! 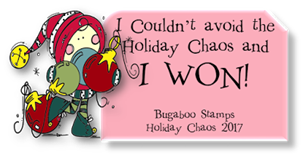 It is day 12 of the 30 day coloring challenge- Wahoo! I am keeping up! I have so many of these beautiful Starform sticker sheets! This sheet has 3 different Christmas scenes- it is on sheet 8502. You peel the sticker off the sheet and attach to cardstock. I applied double sided adhesive first, then the Glitz Glitter, and colored right on top of the glitter using Copic markers. 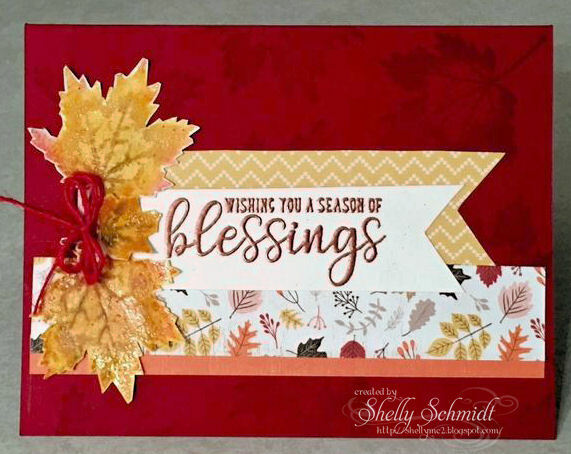 The red is embossed with a retired SU EF that looks like poinsettias. For day 9 of the coloring challenge, I had fun with a sweet Halloween digi from Bugaboo. 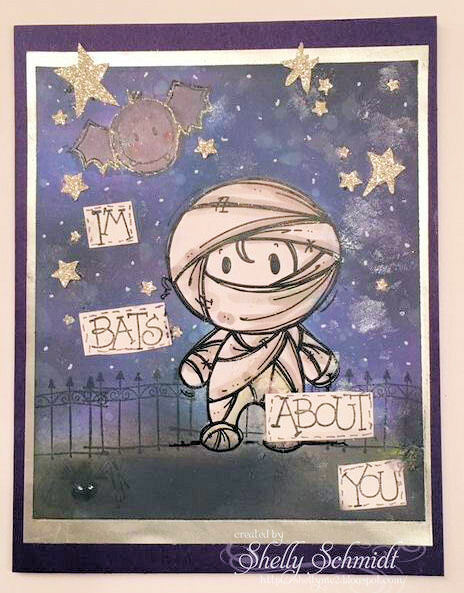 I had already printed out the scene for this sweet Mummy and the Bat, but wanted to use Distress Oxide inks for the background. And, I had only printed one of the scene. I thought I would share my process for inking up the background using Post-it notes. I simply laid a Post-it note on top of the scene, and traced the outer edge. While tracing, I made sure the sticky edge was included -so the mask I make will stick to my image. I can then trim the mask and start inking up. If you cut it out so that there is white showing around your image, just reposition the mask to the edge and ink up that little section to darken it. 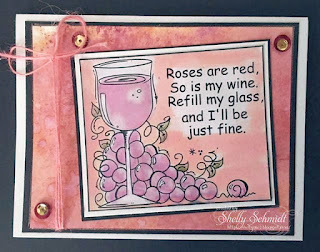 I used Faded Jeans, Wilted Violet and then Black Soot Inks on the top portion of my card. I added droplets of water and shimmer spray. I punched out white shimmer paper stars and also added white dots. I added a fence from an older SU set too. Coloring- just a touch of W1 and W3 copics on the boys face, and C1, C3, and C5 on the bat. I had printed out a few of the Geisha images for my 'Lil Geisha's ATC, so decided to use another- what a cutie! I used a stencil and Dostress inks for the background. I turned the stencil for the 2nd color. The Michael Strng fan was stamped and embossed in red. 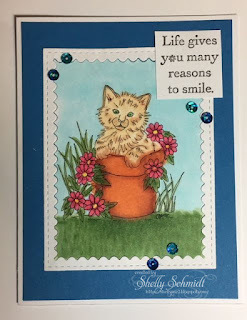 I added lots of Shimmer using a Sakura Gelly Roll pen-Stardust. 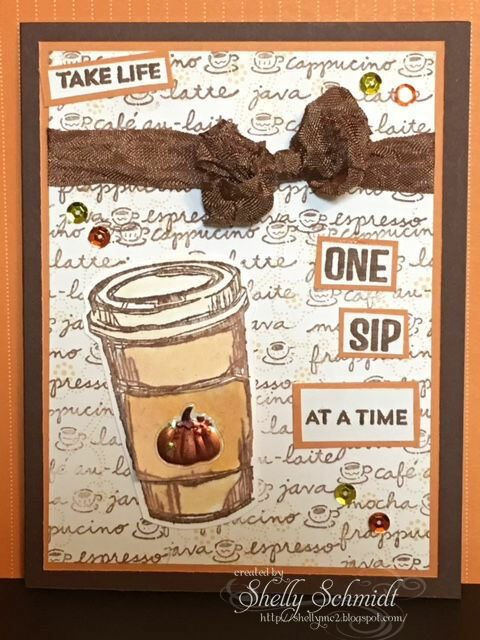 Its the 7th of the month, so time to post my Crafters of Faith September card. It's also day 7 of the 30 day coloring challenge. 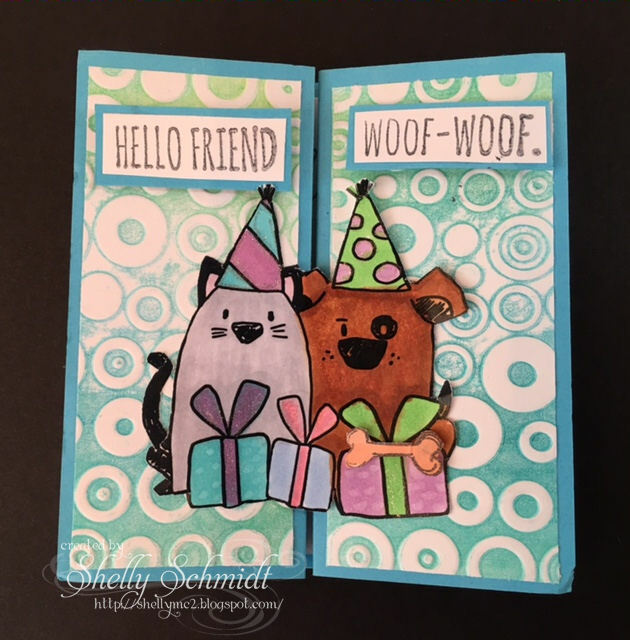 I made this fun card- bright and festive for a Birthday celebration! As September is the month both my sons were born in I like to remember that these boys were two of the greatest gifts God gave to me! (The meaning of their names is Gift of God) So I would like you to create a card celebrating a birth or another great gift God has bestowed on you. 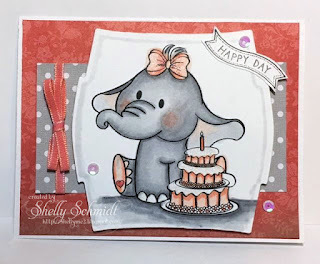 I made a birthday card using an image from TTCRD last Magazine given by Tiddly Inks. I am still feeling a bit sad and missing our dog that just passed- he did not look anything like this dog, but this image brought up those feelings of how much our pets bring us Unconditional Love. So, I will send it to a friend (a gift from God) and it reflects on how my dog was at my side through good and some rough times in my life (a huge gift from God). 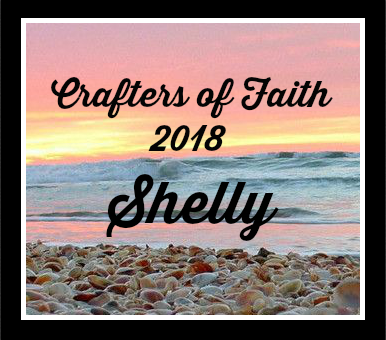 Crafters of Faith is an Open group at SCS- you can find the group if you look under Swaps/Cards/Open/Crafters of Faith. 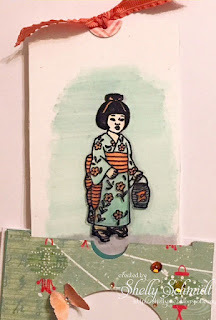 Day 6 of the coloring challenge is another ATC. 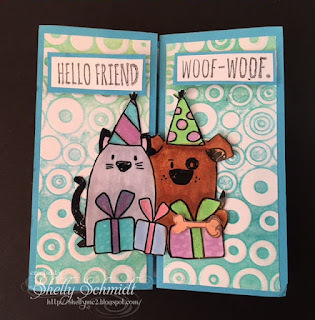 I had fun with this ATC. I used modeling paste through a stencil, and once dry, added color to it. I added 2 flowers and a bumble bee all colored with Copics and added shimmer with Wink of Stella. It needed something, and the sequins was a good fit. I exchange the ATC's with ladies in the Michael Strong Yahoo Group. 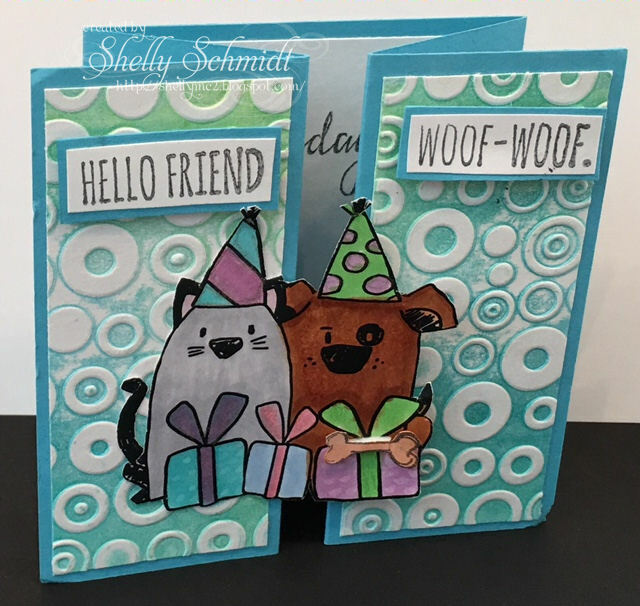 I knew Hetty, the list owner through the technique Junkies Design Team, and am very pleased for the encouragement to use my stamps! 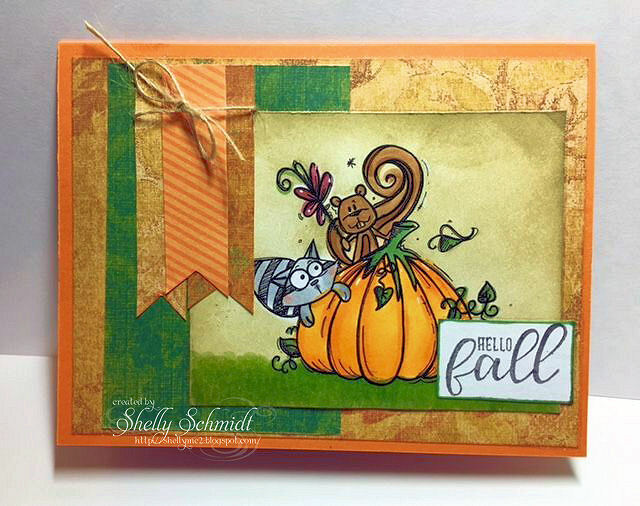 The leaves (Bo Bunny) were colored right on the stamp in the Misti, then spritzed and stamped. I colored with Distress Markers. The centers of the leaves are open, so I watercolored with the lighter Distress markers in the centers, inked and restamped the leaves once they were dry. Next, I stamped Versamark over the tops of the leaves and embossed with clear EP. 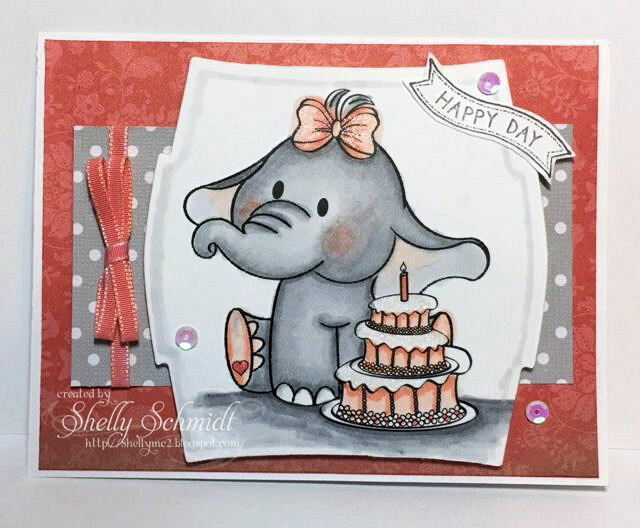 The sentiment ( Sunny Studio) was stamped in Versamark and embossed with Copper EP. The larger of the two leaves was also randomly stamped onto the background (SU Cherry Cobbler) in Versamark. 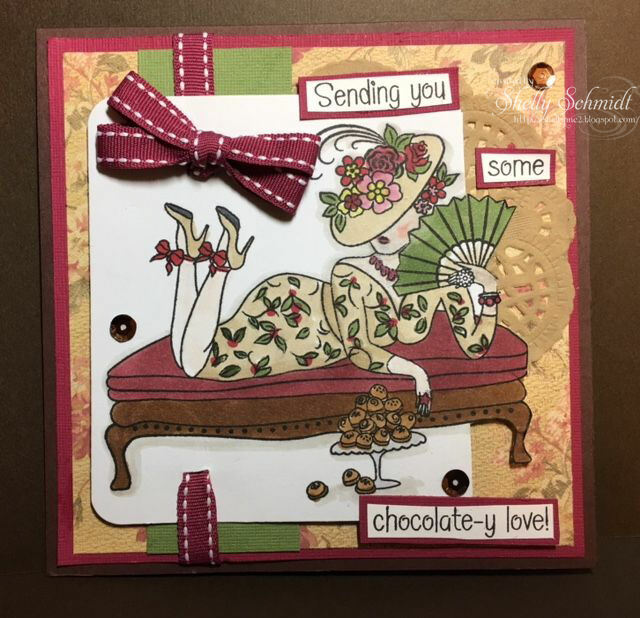 The DP is Carta Bella and was part of the blog candy I won on Instagram. For the 30 day coloring challenge day 2, I am posting an ATC with the theme children from the AOSA Yahoo Group. I found these darling girl digi's at an Etsy store called VeraLane Studio. I thought they would work perfectly for the children theme. 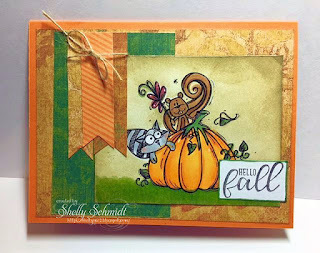 I used background- top embossing paste thru a stencil, middle Elmers glue in swirls then covered with distress ink. 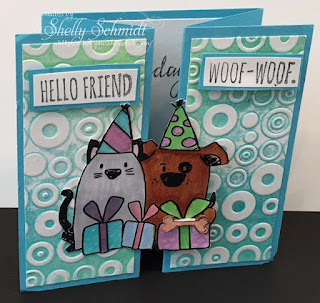 The bottom 1/3 is covered with a mat type cardstock I had in my stash. I am not sure who makes the Friends Asian Kanji. Images were colored with Copics, then I added shimmer with a Wink of Stella pen.